These recordings aren't unreleased and rare anymore and for that fans of the Victory sound will surely rejoice. I know I am. STRIFE, through hard work and consistent quality have become one of the most high profile sXe bands around. Their hard as nails core and heavy handed delivery has appeal that cuts through the narrow confines of scene limitations and appeals to a variety of tastes in the underground from metal heads to power violence freaks. Unfortunately this is the last STRIFE recording as the band are reinventing themselves under the moniker ANGERMEANS. But if they gotta go, this is a great way to do it. 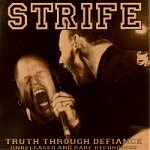 This is flat out the best STRIFE recording ever, primarily because of the diversity it has. These tunes are cultivated from a variety of sessions (including live) and time periods and that makes for a more diverse album that anything else STRIFE has done. I also gotta admit being partial to this band because they are one of the new breed bands who actually manage to capture the feel, vibe, and flavor of the classic 80s straight edge that I so adore.